With so many things to be grateful for, it is hard to share only the highlights of 2013. 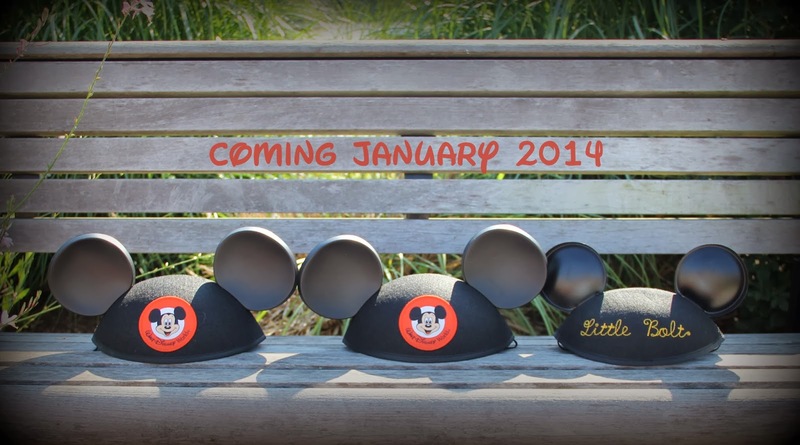 I have a feeling 2014 is going to be even better considering we will finally get to meet our little girl! So as not to bore or ramble too much, I want to share with you a few of my favorite moments from the year. I hope everyone has a fun and safe New Years Eve and I look forward to seeing you all on the other side in 2014! 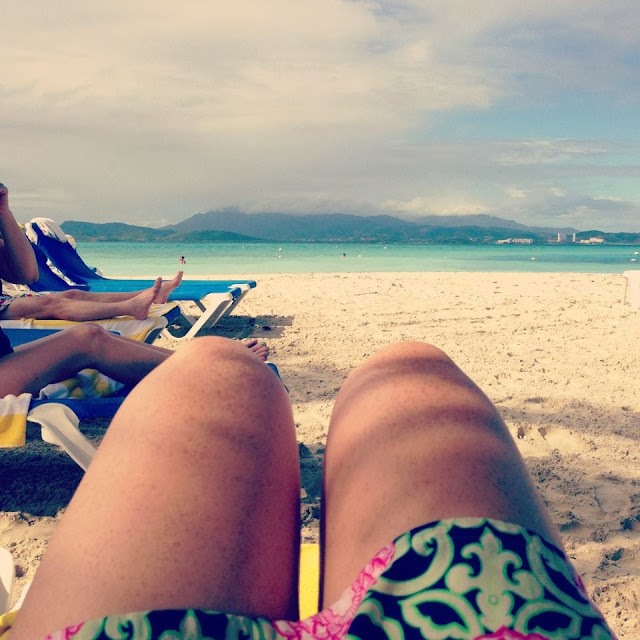 January - Went to Puerto Rico for a work trip! February - We went on a Disney Cruise at the end of February with both sets of parents, and we had a BLAST! April - MY 3rd niece, Sadie was born! June - Went to Disney for the last time without kids! July - We found out we were having a GIRL! August - Ramped up my Etsy shop and began having a lot of fun with my new embroidery machine. September - Nursery planning/projects became the number one priority! October - We celebrated our 3rd Wedding Anniversary at the Melting Pot. November - Enjoyed Thanksgiving with my in-laws at their river house. December - Spent a nice relaxing Christmas at home with family! And that sums up our year with just the highlights. Looking back, we had so many other wonderful moments, but I don't have the time or space to share it all with you. However, our biggest, most anticipated moment has yet to come, but I just know it's going to be the perfect start to our 2014! 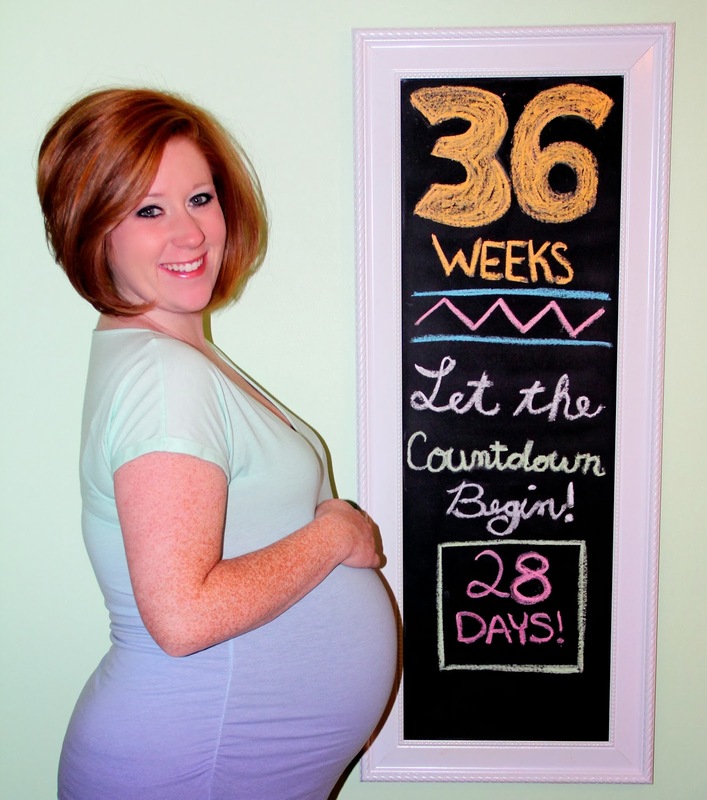 I've decided that since I never got around to doing my 38 week update, I jinxed my chances of her coming soon. So back to the weekly updates in hopes she comes soon! I'm not gonna lie, this has been a hard week for me as I've been feeling really defeated. Now that Christmas has come and gone, I find myself with not much to do but to dwell on the fact that we don't have a baby yet (yes, I'm aware I'm still early, but a girl can dream right?). At my last appointment, I was only 1cm dilated and 50% effaced; I was really hoping for more progress than that and was told to just have patience (clearly my doctor doesn't know me). I have another appointment today, and I'm hoping to have made more progress and if I'm lucky, maybe set an induction date because the last thing I want to do is go more than a few days past my due date. Food Cravings: Ice. It's my favorite thing. Sleep: Sleep is getting harder and harder. I'm so uncomfortable with my arms falling asleep, the heartburn and trying to get comfortable, that I sleep for about an hour at a time. What I miss: My energy! I want to get stuff done around the house, but I just can't seem to do more than one task at a time before I'm laying on the couch or the bed for a few hours. Movement: She is moving less often, but when she moves it's crazy! She is everywhere! Maternity Clothes: Hoping to be packing them up for a while soon! Labor Signs: Sometimes I will fee like I'm having contractions every 10 minutes and then they will stop. So frustrating! I'm doing everything I can think of to get labor started, but I'm quickly realizing that none of it works and she will come when she's ready. Best Moment of the Week: Enjoyed a nice relaxing weekend that included an epic 3 hour nap on Saturday. I don't remember the last time I did that! 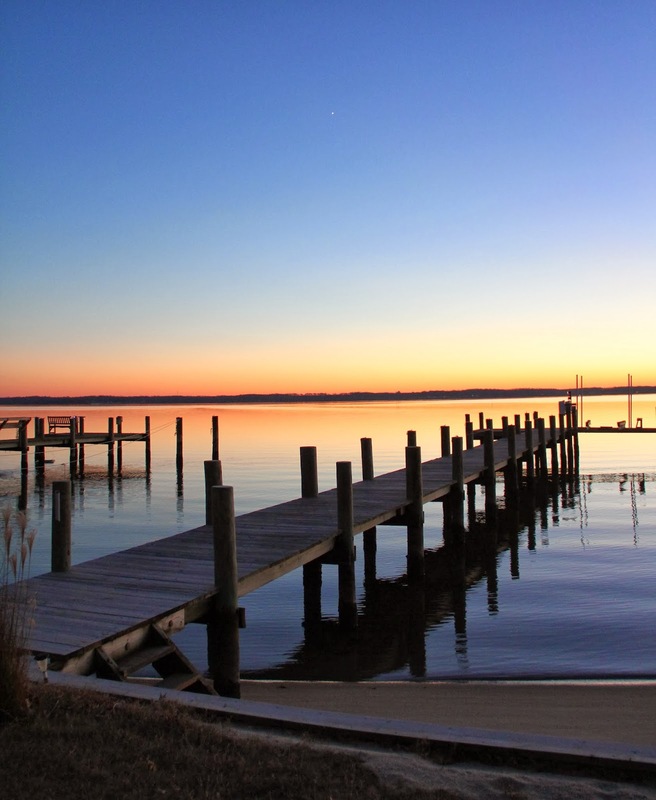 What I’m excited about/looking forward to: Meeting Charlotte! I know we are close! Hopefully no more than 1 week left! I know it's been forever since my last post and you are probably thinking we had baby Charlotte during that time. Unfortunately, no. I was just super busy getting everything prepped for Christmas and took some extra time to spend with my family. 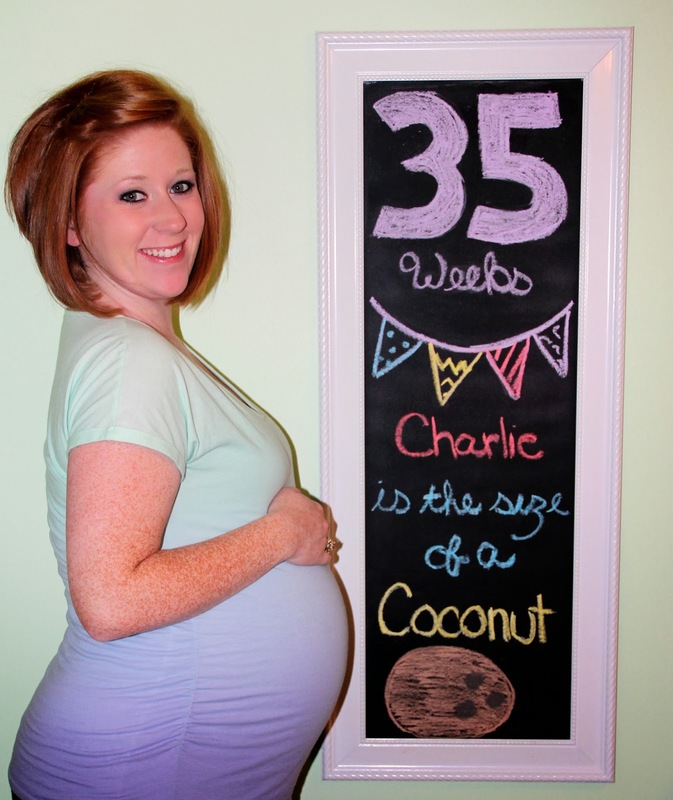 Now that Christmas is over, we are definitely ready for Charlotte to make her appearance any day now! Instead of just 5 high fives, I decided to do a mini photo dump of what the holidays have been like over here. Since I can't travel more than an hour away from the hospital, my husband's family came up to celebrate Christmas with us last weekend. Our nephew, Jacob is so sweet and absolutely adores anything that is soft. He will just face plant into it. My sister has 3 daughters, and this is Hadleigh, her middle child. She is about 18 months and has such a fun personality. She loves playing with her Uncle "Christmas" (as they call him). Her littlest daughter, Sadie, was completely tuckered out from all the festivities and struck this cute pose while sleeping on the couch. A couple weeks ago, we went to a gingerbread house making event where you got to make your own gingerbread house and take it home. The best part about doing this was we didn't have to worry about the mess. We just took a finished product home! My parents house around Christmas time is the best. I stayed on the couch for most of it, but I can't complain about my view! As I mentioned before, I was busy making our Christmas gifts this year. You probably already saw on my Instagram account some of my projects, but here is one of the shirts I made my 3 nieces. Big sister, little big sister and lil sister. I really liked how they turned out. Hopefully they can all get pictures taken in them together! Even Milo loves Christmas! Ok, maybe he was forced into it. But I couldn't pass up this sweet tie at 50% off. He needed to be dressed for the festivities as well! One of my friends, got Charlotte her first ever Lilly Pulitzer dress! I'm so excited for her to wear it hopefully this summer! Isn't it adorable?! Lastly, I couldn't resist this picture. Milo snuggled up and resting on my ever growing belly and watching TV might have been the sweetest thing he's done in a while. I love my cat! That pretty much sums up what I've been up to. I know I completely missed my Week 38 bumpdate and I'm pretty mad at myself about it too. I was so good all pregnancy until week 38. As long as she doesn't come this weekend, I promise to do the 39 update on Monday! I hope everyone had a fantastic Christmas and enjoyed some quality time with your families. 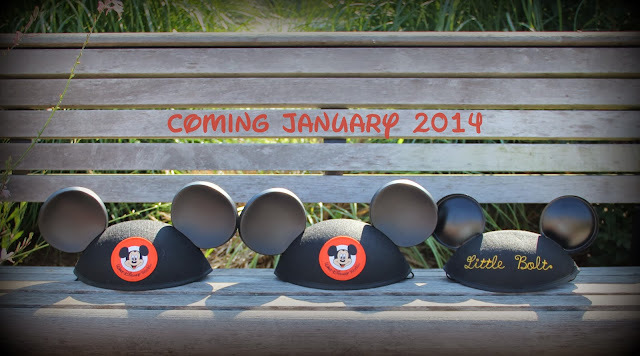 New Years is next and we have no plans in hopes that our new addition will make her debut! Bear with me over these next few weeks as the content on here will be sporadic and not very groundbreaking (not that it ever was). I'm in crunch time with not only the arrival of little Charlotte, but with Christmas just about a week away! I'm so not ready for this! This week feels good. I've reached the full term milestone. In just a few short weeks we should be meeting our little girl and I couldn't be more ready! The Bump: I feel like it's growing by the minute! Food Cravings: I'm really into chewing ice right now. Strange, I know, but it could be worse! Sleep: Still touch and go. Some nights are better than others. What I miss: Normal use of my hands. Since my fingers have gone numb, it makes it really hard to craft and do the things I love. I can't wait to get the feeling back in my hands! Maternity Clothes: Nothing new to say here. I'm ready for my old wardrobe. Labor Signs: Things seem to be progressing normally. I'm having Braxton Hicks contractions every hour or so. Nothing too painful as of yet. What I’m excited about/looking forward to: The big day! I've said it before, but now that we are full term I can safely say she can come any day now! High Five for Christmas Time! I'm so glad this week flew by! I'm already counting down the days until I'm officially on maternity leave! One more free weekend before Miss Charlotte arrives - definitely a scary thought. Enjoy my high fives before baby takes over! First snow day of the year and I miss it! I was in Richmond for work and all we got was rain! I was happy to see that there was still some left when I got home. Almost made it ok! Milo will make a bed out of just about anything. Of course I couldn't resist taking a picture of him loving on the Frye boot box! It was nice to spend some time with my Richmond family this weekend. My little nephew, Jacob is super sweet in his little Sponge Bob hat! It finally happened! My husband wanted to get me a push present and after all my talking about Frye boots he decided this is what it would be. The only reason I have them now is because on Cyber Monday we were able to get them for 25% off! If you know Frye boots, you know they never go on sale. Sot it was the perfect time to get them. I can't wear them until after Charlotte is born mainly because my giant swollen legs and feet can't get in them, but also because they are a gift for after she's born! So in the closet they will go! I couldn't help but share this amazing kitty Christmas sweater. some would call it an Ugly Christmas Sweater, but I call it puurrfect! (yeah that just happened). The best part was I put this on at work to see people's reactions, but no one said anything! I think they were scared to mess with a pregnant lady's emotions. I know I'm super late with this post, but I've made it this far and I'm not about to start skipping a week! I have worked very hard to post these weekly updates and with just a few left, it's better late than never. As of today, my countdown is down to 23 days instead of 28 since I'm nearly done with week 36. Symptoms: Heartburn, heartburn and heartburn. I've learned to sleep sitting up and that tums are my best friend. Sleep: I'm getting used to sleeping a little here and there. Between the numbness, having to go to the bathroom and the heartburn, there isn't a lot of quality sleep happening. What I miss: Everything about not being pregnant. I know that sounds terrible, but as most women at this point, I'm done. Movement: She constantly moves, but I'm starting to feel her lower which is good. Maternity Clothes: Rotating between the same 5 things, but I can see the light at the end of the tunnel! Labor Signs: Really started having Braxton Hicks contractions this week. Definitely an odd feeling, but not painful. Best Moment of the Week: We went to Richmond over the weekend for my father-in-laws 60th birthday party. It was so nice to see friends and family. What I’m excited about/looking forward to: It's hard to wrap my head around Christmas with all the baby things happening, but I'm really looking forward to it! The first part of this week seemed to really drag by. But by the time Wednesday came, Friday was practically here! I apologize in advance for not posting as much these next few weeks. I'm busy with Christmas, prepping for Charlotte and fulfilling Etsy orders! Whew! Don't forget, you have until midnight tomorrow night to get those orders in before I close my shop. No need to fear, I'll be back around mid January. As you know, I spent a lot of time debating what to do for a diaper bag. I loved all your advice and decided to go with a cheap, generic bag that I wouldn't mind getting dirty and can easily be replaceable and then added my own little flare with a monogram! I couldn't be happier with this outcome. Etsy orders have been in full swing this week. This was one of my favorite projects I got to do; make Disney key fobs for fish extender gifts. I think when you get pregnant, your name automatically gets put on a lot of different lists. I can't complain because they sent me two cans of formula and some samples! On Black Friday, Build A Bear was selling these precious boy and girl sock monkey pair for $15. I couldn't resist, as I think they will look good with our Christmas decorations and will be something sweet for Charlie to play with. I couldn't resist not posting this picture of my youngest niece, Sadie. She decided she wanted to cheer for Notre Dame by wearing her Uncle's hat. I apologize for posting late today, as I'm a little off my normal routine this week. I haven't forgotten about my Week 36 Update either. I'm hoping to post that on Wednesday. 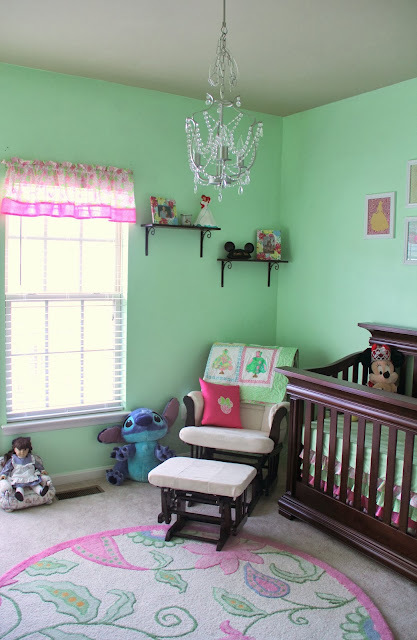 As for today, I wanted to reveal Charlotte's nursery! You've seen most of it through various DIY posts, but I think it's more fun to look at the finished product, don't you agree? 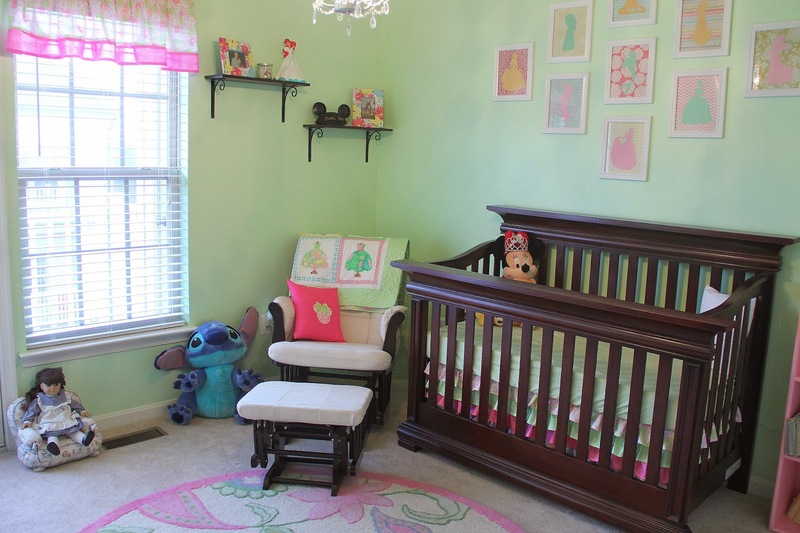 A lot of people are shocked that I didn't go with a straight Disney theme for Charlotte's nursery. To be honest, I didn't want it to be over the top. I felt like once you started getting the bedding sets and wall art, it would just look like a Disney explosion. Usually I'm all for such a thing, but I wanted this room to be special and unique. I wanted to create as much as I could on my own. so as far as themes go, I like to call this room "My Favorite Things". As you scroll through the pictures, you will see a little Disney, Lilly Pulitzer and shabby chic all come together in one place. The chandalier was one of the first pieces I bought as soon as we found out we were having a little girl! It's from Ikea and was the perfect inspiration piece to get the rest of the room to come together. I'm borrowing (using this term loosely as my mom reads this here blog) this glider from my mom. i convinced her that I could make better use of it than she was since it just sat in her hallway upstairs. You will see the quilt draped over the back, yeah mom made that. It's pretty awesome don't you think?! Here it is up close. 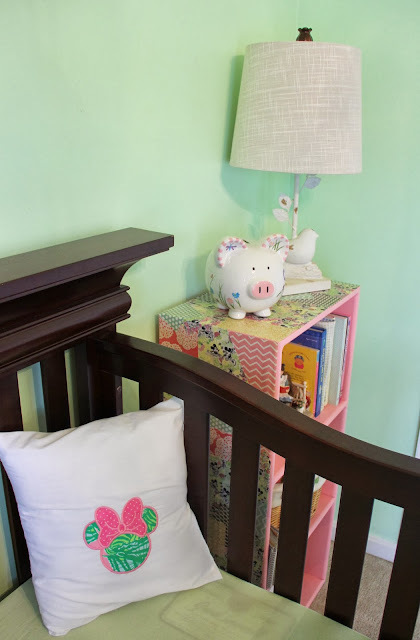 She used Lilly Pulitzer fabric for all the little dresses and the rest of the fabric is from other projects throughout the nursery to help tie everything together. Ok, I lied. 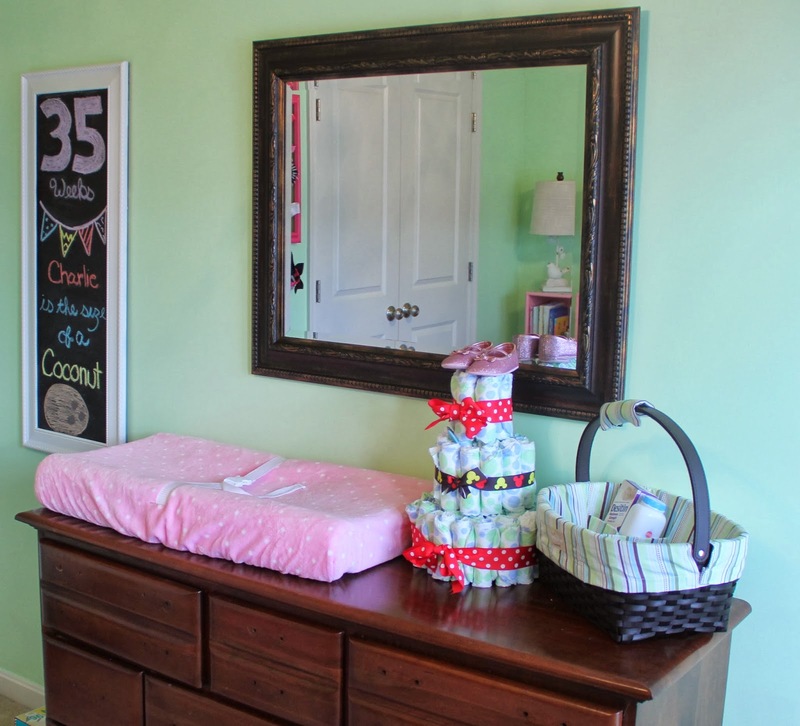 The first thing you probably notice in this picture is the fact that the dresser is missing it's drawer knobs. This is the last thing I need to get done and it has become the bain of my existance. 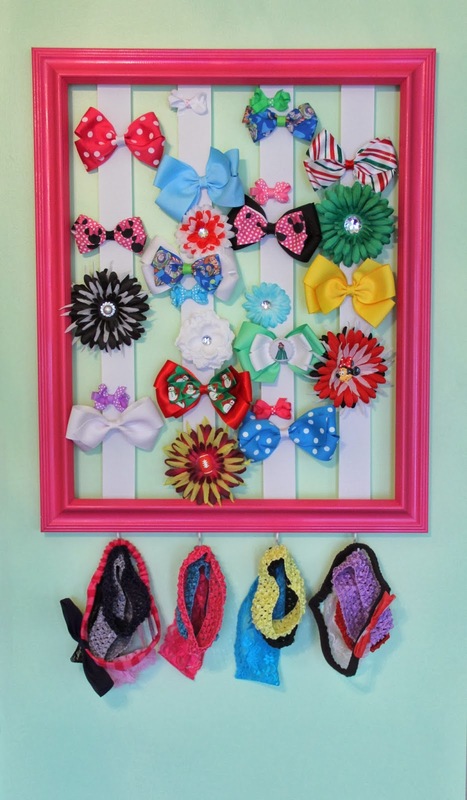 No little girls' room is complete without a place to store all those bows and headbands! I made this bow holder (link to tutorial below) and decided it was missing something: a place for all those headbands. All I did was take "S" hooks and screw them into the frame and Voila! My mom had some leftover Lilly fabric from the quilt so I decided to make a couple of pillow cases for the crib and glider. Just another way to tie the Disney/Lilly theme together. 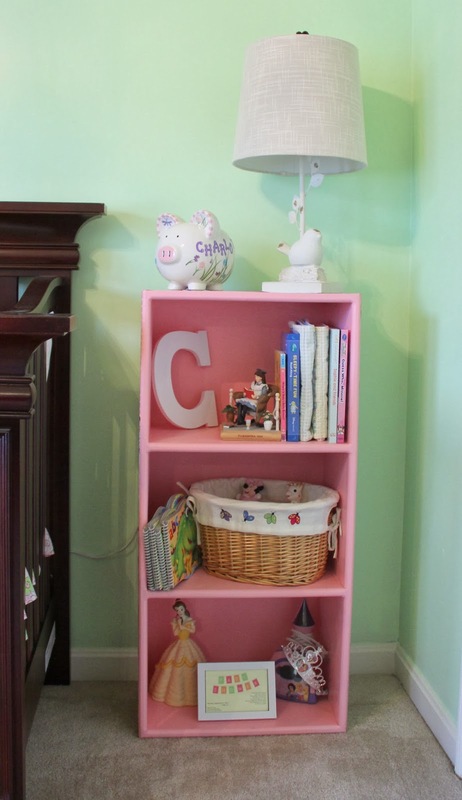 One of my favorite projects was this bookcase. You can't really see in this picture (check out the one above it), but I painted and decoupaged it with scrapbook paper and a Disney Lilly Pulitzer print that I printed off from online that was done decades ago! In this picture you can see the wall art above the crib is Disney Princess silhouettes backed with the same scrapbook paper from the bookcase. So there you have it. I really couldn't be happier with how everything turned out. The whole process was definitely a labor of loved (pun intended) and it came together one little project at a time. Below is a list of all the project tutorials I did for your reference. 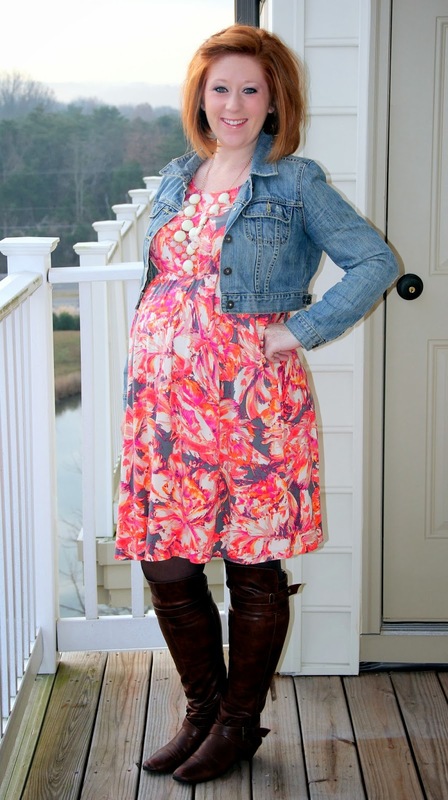 When you're pregnant you want to buy maternity pieces that can be worn through a few different seasons. I try to get as many things on clearance as I can since budgeting for a new family member is expensive enough without having to buy a brand new wardrobe. What this will mean is the pieces I get on clearance are usually from the season prior. Don't let that stop you though. You can make a lot of summer things transition to the fall and even winter with the proper accessories. For today's outfit, just adding tights boots and a jacket (dress is sleeveless) instantly turned a summer dress into the perfect fall dress. 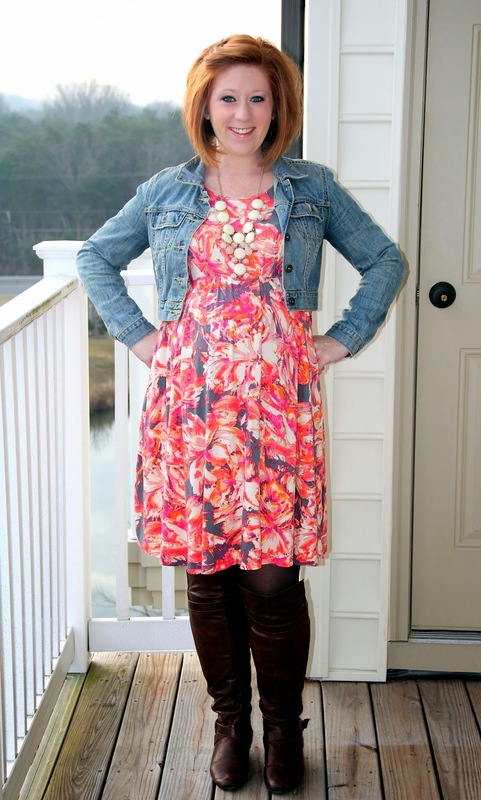 Who says you can't wear florals in the fall?! It's always hard going back to work the Monday after a holiday weekend. I'm just grateful that I only have a few more weeks, before I'm on maternity leave! We have everything we need for Charlotte, so as far as I'm concerned, she can come any day now. The Bump: Staying the same. Hopefully she drops soon! Symptoms: The nausea that I had from the first trimester is back. Thankfully I don't actually get sick. I just feel super nauseous if I go too long between meals. Anything Making Me Queasy or Sick: Not eating makes me sick. Sleep: Numbness is getting so bad! I wake up multiple times a night with no feeling from my fingertips to my elbows. I think this is one of the worst symptoms. What I miss: My lung capacity. Climbing the 4 sets of stairs to get into my house gets harder and harder everyday. Movement: Still tons of movement. I'm not sure if this foreshadows a very active little girl. But I never go more than a few hours without feeling her. Maternity Clothes: Officially over it. Labor Signs: Not that I know of! Best Moment of the Week: Thanksgiving of course! It was fun to spend time with family and to see everyone so excited and anxious for Charlotte to get here! What I’m excited about/looking forward to: I have an appointment today and I'm hoping to get some more information on her size and positioning. Who knows, maybe this will be the month we bring her home! Linking up with Molly for Funday Monday!